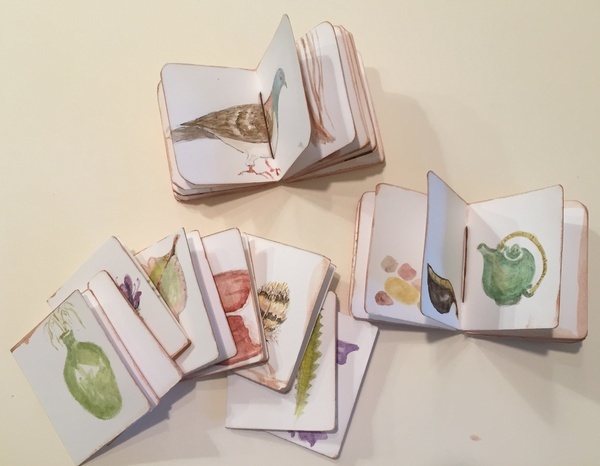 I am using my previous sketchbooks done in Australia as the source for these tiny books. It is easy to get lost in the memory of each page. Some of these are from spending time with Barbara Rowe at her condominium in Melbourne. See that teal tea pot there? I sketched this pot every time I stayed with her. The color, the shape and that carved open spout. She has had it for years and always fixed me tea in it. Another memory of her is that first one on the left. Barbara is an extraordinary master of placing things together. It could be her ikebana training or she is just a natural. Anyway that was the largest green glass pot that held just a couple of stems of grasses. The way the light caught in the glass and colored the things around it and the way the breeze rustled the grasses as it swept gently through from the balcony ten floors up was so beautiful and quiet. I loved staying with her because of the quiet and gentleness of her and her things. One time she took a tangerine and used a bit of hand twisted daylily leaf to tie it up like a gift. Then she placed it on a bit of dried hard green grass she rescued from someone’s mower on the street and placed this arrangement in the center of the table. 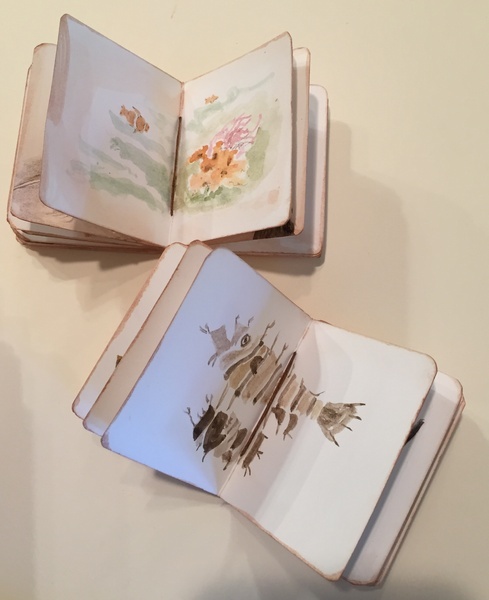 It was beautiful and that tangerine is sketched onto one of these pages. 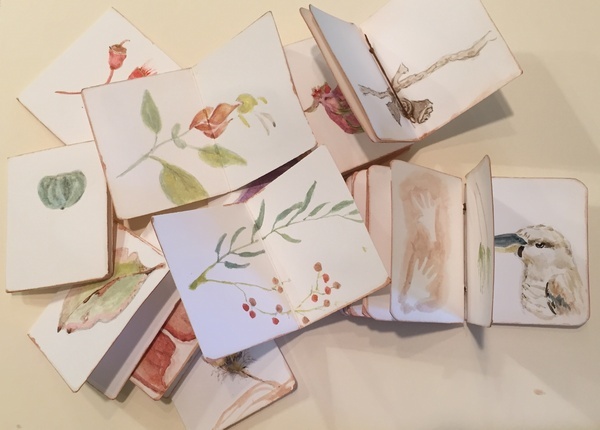 And some of these pages are from the garden between Janet DeBoer’s house and Gallery 159 out the back. Janet would be busy writing and organizing the Textile Fibre Forum magazine and I would have the quiet time in this space to pick up leaves and pods to record. I think that is called a shrimp plant that I also found in her yard. The pepper tree branch in the center of the picture is from the ride across Australia in 2001. I treated myself to a first class ticket on the Indian Pacific Railway and because I was a lone traveler, mealtimes found me filling in at tables made up to seat four. Luckily I was placed quite often with three sisters traveling together. When they saw my sketchbook they would pick bits of the bush whenever we stopped to look around. I do not think the peppers are edible but they were so delicate to draw with those lovely flowing little leaves along the thin branches. I had made a special book to take on this train ride for all the things I wanted to write about only, no sketching. I left it on the train and it was lost forever. But the sketchbook from that time brings some of it back. And you can not be down under without seeing and hearing a kookaburra. The Great Barrier Reef off the coast of Cairns and then Melbourne and the work of John Davis seen in the most amazing exhibition of his life in art. All those fish made with muslin, sticks and asphalt. The catalog from that show is right up there with the one from Lee Bontecou’s retrospective in Chicago. Both heavy on earth tones. Both keeping you transfixed in place while you just look in wonder and appreciation that an artist can and did do this. I wish there was more work like this. So much today is “showy”, colorful, and about being beautiful. It seems the materials used is what the work is about. And we can all look at it and say, “lovely”. And that is all there is to say. We were having a talk the other day in the studio about this. If someone who makes lovely arrangements of Japanese bits and pieces into collages and then teaches a workshop in doing collage, I would guess that the students would bring to class all their bits and pieces similar to what the instructor uses. And with a couple reminders from the instructor on good design basics, they would end up with pieces all looking alike. There would be bits of exposed Japanese writing, some beige paper, corrugated card board is often used, a bit of that rich dark red, but not too much, maybe an old piece of wood or an old paint brush, a smear of gesso, something tied down with raffia, you get the idea. And yes, some stitching somewhere. But if just one person was different. What if the only thing she had that she loved and wanted to use was old plastic bread bag closures in various colors. They are not particularly pretty, so making something beautiful or “lovely” might be out of the question. But to me they seem so much more powerful because she has them for a reason. Some of them have expiration dates on them. Her work becomes about time, expiration, “daily bread” and says something about her as an artist. These little bits of plastic seem so much more powerful and important than the placing of pretty objects. And the work becomes quite likely unforgettable. And once you see them in an artwork, you do not forget. I still remember a student in my class a good fifteen years ago whose husband told her earlier that month that he did not love her and was leaving after over forty years. He told her this after she had fixed his breakfast. She went to the kitchen and took off the bread bag closure that had that date on it. She used it in a book about her family life. Anyway the conclusion of the discussion is that some of us look for meaning that simply is not there. Some do work that is just fun to make with pretty materials. And some of us can’t even pick up a bit of anything without the meaning being there first. Okay enough. My foot is out of the boot. I am in crocs and art group is tomorrow.